How do you solve the problem of a broken sewer pipe that is 10m below ground level underneath the basement of a multi-story office block in the City of London when you cannot dig up the street, cannot make a noise during office hours, and cannot place skips for rubbish removal because of the fears of bombs? This was the problem that faced the owners of the building in London's Minories a few months ago. After calling in the drain clearance experts, it was established by the use of cameras that a l50-year old clay pipe had fractured and collapsed and so a call Was made to RDF Group to see if they could solve the problem. Having had a look at this particular situation, we carried out a desktop survey in order to ascertain what problems we might encounter. What we discovered was that the pipe that had fractured and collapsed ran down at an angle of 45° to a depth of some 10m below road level and appeared to be very close to the Circle Line of the London Underground. In order to get access to the collapsed area. we would have to sink a shaft but you cannot do this at 45° and so we bad to find an alternative solution. In the meantime, the basement was gradually filling with sewage from the fractured pipe! The first task was to solve the problem of the sewage. As has already been explained. because of the location of the building within the City of London, no work could be carried out from the street and it was not permitted to create any noise during normal office working hours, except for one hour during the afternoon and then after 7pm. With this in mind, an enormous sewage tank was created in part of the basement of the building and this was then pumped out every 24 hours, in order to keep the office block working. Tbe next stage was to estimate just where the exact collapsed area of pipe was located in order to sink 3 vertical shaft down to it. Heavy gauge (8mm thick) steel piles were then driven hydraulically down, using silent hydraulic jacks, to the I Om level. working from the basement,which was itself about 4m deep. This had to be done hy working through the night, having first cut through the bearing foundation pad of the multi-storey building, which had several hundred ronnes of pressure bearing down upon it. As the piles were driven down, the enclosed soil and debris was removed during the day, directly into waiting lorries, to be ta ken away. Once the 10m level had been reached, a hole was cut in the side of I the shaft that had been created and a reinforced steel tunnel formed, allowing access to the fractured area of pipe. Robert Webb explains: "What we found was that the pipe adjacent to the collapsed length was embedded in the concrete lining of the Underground. We were warned by Transport for London (Ttl) that if we found that the fracture went under the railway tunnel lining, then we would have to install a laserguided monitoring system on the walls of the working tunnel in order to detect any movement and, furthermore, take out insurance to the value of £150 million!" The fracture was in a 12-inch diameter clay pipe that had been installed at least 150 years earlier and was shown clearly on a drawing that was obtained from Ttl's archives showing the original 'Metropolitan Railway plan of the Aldgate to Tower Hill Extension with a Stoneware Drain Pipe on West Side of Minories'. The team carried out a camera survey of the pipe where it went into the concrete lining and discovered several more cracks. It was decided to line the cracked section of the clay pipe and so a fibreglass 'balloon' was inserted into the pipe and inflated. Once this had cured, a cutting tool was sent down to the far end to remove the end of the balloon, leaving a sound lining. A new 12-inch diameter cast iron pipe was then connected to the original clay pipe and a deep manhole created. The steel shaft was then filled with concrete that was aerated to ensure that there were no voids that might lead to slippage.The building's sewer pipes were then diverted into the new manhole and the floor replaced. 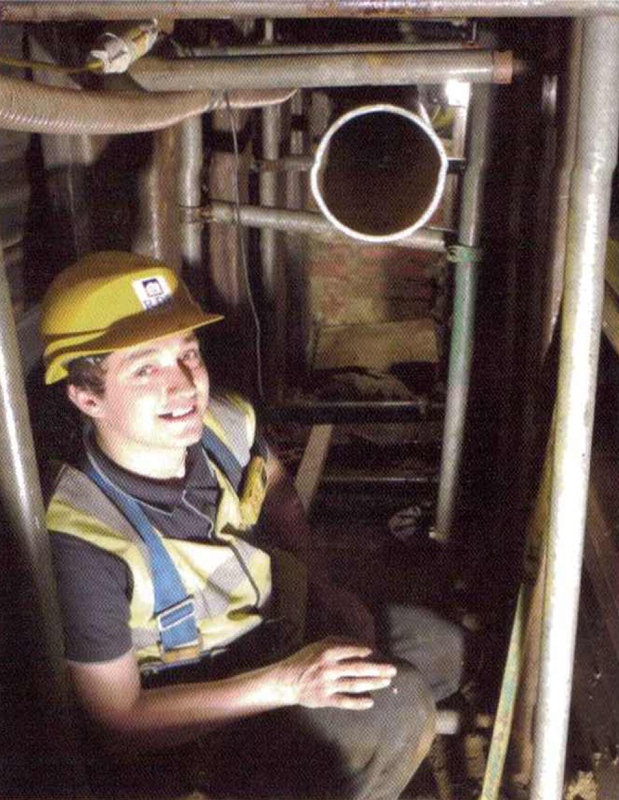 "Because of the conditions in which we were working, it was essential that all of our operatives were fully trained in working at depth and in working in confined spaces. All of our team are trained in these areas and are equipped and trained to use breathing equipment," explained Robert. "We installed a dedicated fresh air supply and set up constant air quality monitoring equipment with alarms sounding in case of a gas build-up or low oxygen levels. "The project took about three months, although we were only actually on site for about two-thirds of this. It was an interesting encounter for our whole team, even though we are well-experienced in working on this type of project. We also had some interesting comments: Steve Lane,1\Contracts Manager: "This is certainly one of the most unusual projects 1have been involved with. The whole tunnel would vibrate as the trains rattled down the tunnel just a few feet away on the other side of the wall." The Transport for London Inspector: "I went to the site again yesterday and I was very pleased with my observations, the shaft and the tunnel have been very well propped and the fall-arrest system not only in place but it was being used. The site was kept clean and well managed with good hygiene facilities in place. When we see a site managed like this we have confidence that our infrastructure is being protected. Please convey my thanks to the site crew." Robert concluded, "I would say that this is probably the most technically challenging job thor we have tackled. However, over the last 21 years we have done many projects and are probably one of a very small number of companies that could have done this job. All our projects are engineered in-house using the latest AutoCad and 3D-modelling, but, above all, I like to thiuk that we still retain my father's values of quality of work, attention to detail and customer service."